Providing you the best range of xt process controller, indicateur matrix controller and dp100 process controller with effective & timely delivery. 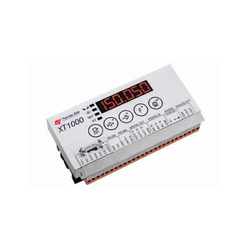 The XT1000 is a high-speed Process Controller and transmitter with an Omega/DIN rail mount configuration. 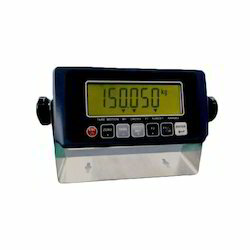 With a speed of 2400 measurements/second and several connectivity options, it is the ideal solution for a very wide range of weighing applications ­ both static and dynamic. Connectivity options: digital I/O, RS232/485, MODBUS (RTU or ASCII), Analogue outputs (e.g. 4-20mA), Profibus® DP, PROFINET I/O and EtherNet/IPTM. 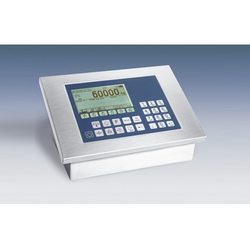 Designed for process weighing systems, as well as any machinery with a weighing function, it incorporates the latest digital electronics. The instrument status is easily viewed using the 6-digit bright red LED display (10mm height) and status LEDs for tare, prefixed tare, zero and steady weight. Surface mount, IP66 polycarbonate enclosure with integral Omega/DIN rail and pre-assemble the dearth terminal, for mounting of XT1000 transmitter and optional power supply (see XT1000-2000-PS). Fitted with 4 x PG7 and 2 x PG9 cable glands. Impact resistance IK07. Transparent lid. Power supply, Omega/DIN rail mounted. 100-240V AC, 50/60Hz, to 24V DC output. Refer to the XT1000 data sheet for more detailed information. We are providing Indicateur Matrix Controller products to our clients. We are providing Dp100 Process Controller products to our clients.